Afra Mussawisade is one of todays most skillful and creative percussion professionals. Rhythm is Afra´s language, his mother tongue. Musical communication with other musicians is both to him, “a fascination” and “a great source of joy”. Afra was born in Teheran in 1973 as son of famed artist Shahab Mussawisade. During his childhood in Iran, Afra was constantly surrounded by musicians and artists for whom his family kept an open house. He was first educated in Persian classical percussion by Arjang Kamkar and Tonbak-Master Farhangfar. Afra immigrated to Germany in 1983 where he learned to play piano and cello. This is when Afra also started to study various drumming styles from different cultures. Next to studying Latin American Percussion at the Rotterdam Conservatory for Music and Dance (NL) he attended classes with masters Martin Verdonk, Luis Conte, Nickey Marrero, Glen Velez and Alex Acuña. Afra continued with his studies, travelling to different parts of the world. He learned from percussion masters at the conservatories of Santiago de Cuba and Havana, Cuba. Afra has traveled to India several times to deepen his knowledge in South Indian Percussion, among others he studied at the Karnataka College of Percussion. By incorporating all these influences Afra has developed a very unique style and technique, played on an equally original setup. As he keeps exploring and evolving his music, he continues to refine his setup, adapting it to the musical needs. Afra´s fluent skills are much in demand. He has performed, recorded and toured with artists including WDR Big Band, Till Brönner, Jeffrey Bruinsma, Oene van Geel, Mezzoforte, Drums United, Scapino Ballet, Praful, Manfred Leuchter, Jeroen van Vliet and Zapp String Quartet. 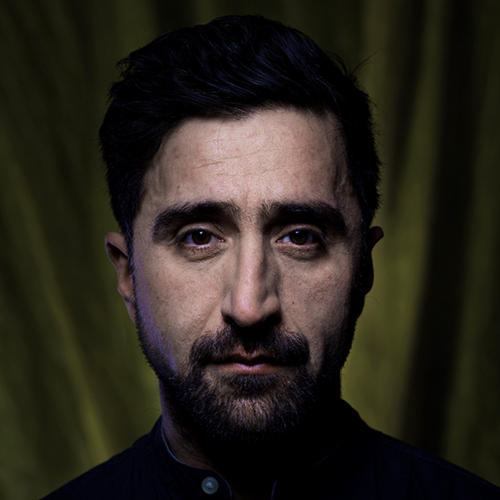 “Mussawisade is a sheer wizard on his extended percussion set, contributing subtle accompaniment as well as overwhelming virtuosity”. “His vocabulary consists of oriental drums as well as those at home in western culture”.